You can check places, search for direction and even it can guide you to where you want to go! Who to ask or say where to ask? It's on your computer, tablet or smartphone! Google Maps pull the data of places up from a satellite. There was a time when satellite imagery was conspiracy talk, only available to high-level government officials, or, like, spies. But thanks to Google Maps, Apple Maps, Bing Maps, Mapquest and the dozens of others out there. We can see satellite images every day! For FREE! Though, we just use them to find the nearest restaurant for food trip. The first reconnaissance, or spy satellites were the Corona satellites launched in the 1960s. They had film cameras on board, and to get that film back to Earth, they ejected it with a parachute and had to go pick it up! The Air Force would try and snag it out of the air, or the Navy would sail over once it hit the ocean. These early experiments taught us how to take pictures from a moving satellite of a moving planet while 100 miles up. For example, the lenses on the Corona satellites rotated constantly to keep the shot steady. They even tried angling two cameras to capture a stereo image! Spy satellites were so good at grabbing images without letting the spyees know what was up, the United States and other nations continue to use them! But when Google acquired satellite imaging company Keyhole in 2004, they changed the whole game. Now anyone could look down on the planet and make comments. Images still blur in sensitive areas, as required by world governments, but mostly the images we're seeing are way better than the ones we used in the 1960s to determine how to avoid World War III. 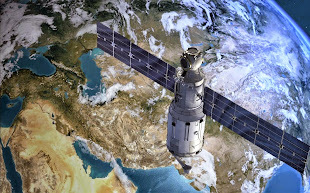 Today, the actual satellite images are taken by companies like TeleAtlas, DigitalGlobe, EarthSat, Skybox, and others. They're then sold or licensed to governments and companies for geology, mapping, urban planning, shipment tracking—the applications are endless. This is why some of the images on satellite maps are lower resolution than others. Each company is working with different equipment so each camera get different resolution images. There are regulations for keeping the companies from scanning faces, backyards or license plates. A few months ago, regulators loosened restrictions on U.S.-based DigitalGlobe. So last time, they launched the WorldView-3 satellite, their highest resolution sat ever. Which means, in a few weeks, maps could see images with a resolution as high as 25 centimeters! Basically, they'll be able to see a piece of paper you're holding, but they're not allowed to read it. DigitalGlobe wanted to launch sats with 10 cm resolution, about the size of your phone screen. Google says the data on their maps are updated as often as possible. Though these images are not live yet. Some images are as new as two weeks old, and none are older than three years. Which means this new, high-res 25 centimeter imagery might be appearing soon. Each mapping company is in charge of stitching the images into one, giant map, adding the locations of interest and keeping it regular. There is Map for Real Time Viewing! Speaking of real time data; that stuff is notoriously locked up. Remember, the satellites are moving, the planet's moving. Viewers of live images can only see what the satellite is looking at during any particular moment. Using a satellite camera for your own personal reason isn't really practical. However, not only higher officials can use the realtime imagery. NASA program called EarthKAM is letting students get access to real time space cameras—not via spy sats, but via a camera right on the International Space Station! Schools around the world are signing up students by the thousands to explore our planet using live images, because there's just something about seeing this information in real time, right? Students of the Sally Ride EarthKAM program can directly control the camera, taking pictures of the Earth and analyzing human geography, geology, ecology, and global change! They even learn about space operations and do flight control simulations! How do you feel about satellites getting more accurate images? Should we freaked out? Excited? Tell us how would it be great if you can totally control the sats? You know, travelling the world without even making a single footstep out of your door. Thank you for reading How Google Maps Make It On Business; Space Satellite Maps Realtime Imagery posted on the website Kwentology if you want to redistribute this article please include the link as the source. Have some kuwento to share? Contact us!